Toots Shor is many things to many people, said Edward R. Murrow of the legendary Manhattan saloonkeeper in 1955. A friend to the famous, a crook to the feds, father, brother, gambler, bum, but most of all Toots Shor was the owner of America s greatest saloon. Directed by his granddaughter, TOOTS is a provocative, loving and unmistakably authentic portrait of the self-made, unapologetic and quintessentially American man who became the unlikely den-mother to the heroes of America s golden age. Politicians and gangsters, sports heroes and movie stars -- Sinatra, Gleason, Dimaggio, Ruth, Costello, Eisenhower, Nixon, Warren -- for 30 years, they all found their way to Toots eponymous saloon on New York s West 51st Street for food and drink, served up with a heaping side of insults and put downs. 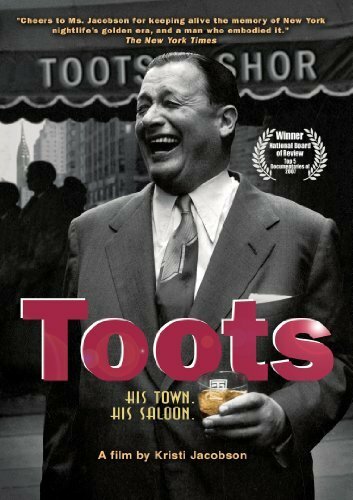 From its post-WW II heyday to its devastating decline in the 1970s, this film reveals as much about the city Toots loved as it does about the man and his enduring legacy. Featuring: Walter Cronkite, Mike Wallace, Frank Gifford, Whitey Ford, Yogi Berra, Nick Pileggi, David Brown, Peter Duchin, Maury Allen, Dave Anderson, Bill Gallo, Joe Garagiola, Sidney Zion, Gay Talese, and Gianni Russo. If you have any questions about this product by IndiePix, contact us by completing and submitting the form below. If you are looking for a specif part number, please include it with your message.